Contains Sulphites.” These are words you see on almost every commercial bottle of wine, but so many do not understand what this means. Danny's Wine and Beer Supplies will get to the bottom of sulphites in wine, compare commercial wine sulphite levels to craft wine, discuss how you can reduce them when crafting your own wine, and provide tips for storage and consumption.your own wine, and provide tips for storage and consumption. Sulphur dioxide (or SO2) is a chemical compound made up of sulfur and oxygen. It occurs naturally but can also be produced in a laboratory. It’s used to preserve foods and beverages, which it does by acting as an antioxidant and antimicrobial. Are Sulphites in Wine Bad? Not for most people. There are however some notable exceptions to this rule. About 5-10% of people with asthma have severe sulphite sensitivity. Sulfur is also on the rise as a concern among the populous as a cause of health problems (from migraines to body swelling), because of its prevalence in processed foods. One of the many unique benefits of crafting your wine, is that you can customize the wine to your needs – and if reducing the sulphite levels is one of those needs, you’re in luck! If crafting in store, be sure to discuss this with your craft wine retailer and they will assist you with this. 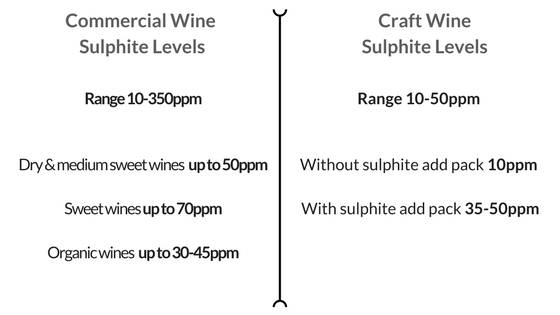 If you are crafting at home, you can opt to not add any sulphites to your wine to reduce their level. However, there will still be some present in the final product (10ppm), as it is a natural by-product of fermentation. If you are adding sulphites via the add pack, as per our instruction sheets then the final product will have between 35-50ppm. Ensuring that everything is properly sanitized when crafting your wine and using longer corks to minimize oxidation will help ensure the quality of your wine. Note: Most retailers will waive their 100% satisfaction guarantee if you opt to omit using the sulphites add pack. Craft wines that have been crated without the sulphite add pack should be consumer when they are young, as they are not as protected against bacterial infection and oxidation. We would recommend drinking them within 2 weeks to a maximum of 6 months from their production date. They should be stored in a temperature-controlled environment (less than 16°C/60°F) out of direct light. Contrary to popular belief, we do not recommend storing your wine in a refrigerator long-term unless it is set to a “cellar” temperature. As when wine is stored at lower temperatures, it could cause a precipitation of tartaric crystals.